The Les Cheneaux Historical Association is the proud sponsor of the Annual Antique Wooden Boat Show and Festival of Arts. 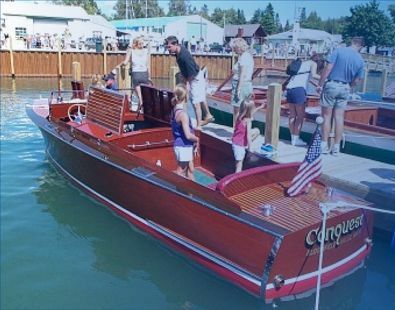 Held annually on the 2nd Saturday in August, visitors and residents alike enjoy this event with its beautiful wooden boats, quality artist's wares, dockside traders, and concessions. The show continues to promote wooden boat building & restoration which is an integral part of the maritime history in our area. The proceeds from the annual show enable the Historical Association to maintain the Historical & Maritime Museums in Cedarville. Visit the Antique Boat Show website.